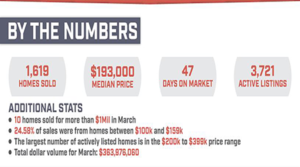 TUCSON, Arizona – Tucson Association of Realtors (TAR) released stats for March and sales volume continues to rise another 32.47% from last month and 15.47% from March 2016. Average Sales Price slightly decreased 0.10% this month to $224,8152 from last month’s $225,032, per the Tucson Association of REALTORS® Multiple Listing Service. The Average Selling Price compared to one year ago is still up by 5.55% from $212,988, and the Median Selling Price jumped again this by another $4,000, up 2.02% since last month to $193,000 since this time last year. This is also a 9.01% increase over March 2016. Total sales volume of $364 million increased 32.47% from February’s number ($275 million) and is up 8.58% from March 2016. Unit sales month-over-month shows 1,619 homes sold in March compared to 1,221 in February, an increase of 32.60% and up 9.39% from March 2016 (1,480 home sales). Total Pending Home Sales in the pipeline shows even more optimism for 2017, and increased by 10.44% in March over February, down slightly by -2.9% year-over-year. The highest activity was in the Northwest area this month with 436 homes sold, followed by the Central submarket with 215 homes sold. Total Active Listing of 3,721 decreased 1.17% from last month on Tucson MLS a decrease of 22.51% from March last year. Average Days on Market for March decreased to 47 from 52 last month, and decreased 17.54% from March 2016.